Determining sample size is a very important issue because samples that are too large may waste time, resources and money, while samples that are too small may lead to inaccurate results. Hence, it is required to determine the minimum recommended size of your survey. If you interview this many people you'll get results that reflect the target population as precisely as needed. 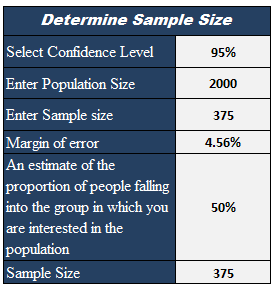 Total number of individuals about which sample size calculation is required. Number of individuals required to respond to respond to achieve the required level of accuracy. Margin of error or Confidence interval is usually reported in opinion poll results. It is a 95 percent confidence interval i.e. for every 20 times you repeat this poll, statistics say that one time you'll get an answer that is completely off the wall. For example: the poll had a margin of error of plus or minus three percentage points (3%) and 51% percent of your sample picked an answer you can be "sure" that if you had asked the question of the entire relevant population between 48% (51-3) and 54% (51+3) would have picked that answer. 12 Responses to "Sample Size Calculator with Excel"
I have a mean value of a parameter and a standard deviation with a sample size of 6: if we assume a normal distribution then how do we calculate the expected mean from a ample size of 12.? Skipping classes is a major no-no. Taking notes will enable you to focus and it fills in as a supportive reference point, when you're concentrating later.